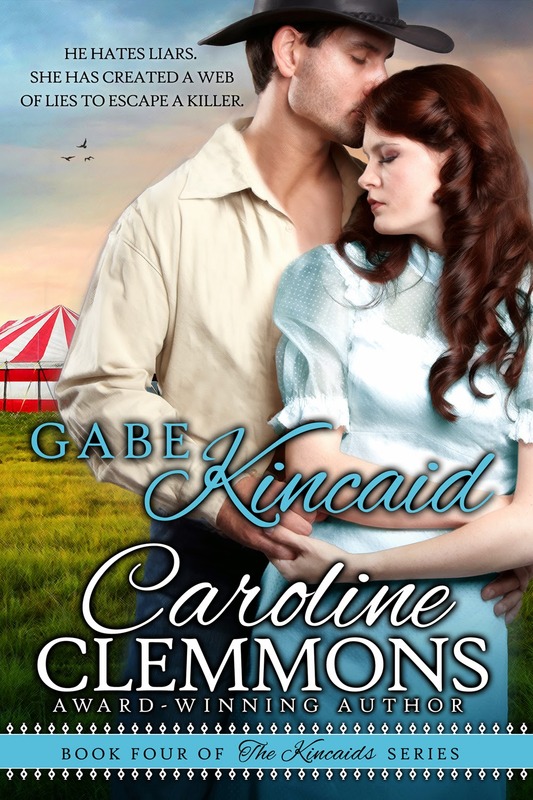 Love Saves the World welcomes Caroline Clemmons, who is currently on tour for her book, Gabe Kincaid. Caroline will be awarding a $25 Amazon gift card to a randomly drawn winner via Rafflecopter during the tour. To visit Caroline's other stops, click here. Katie Worthington poses as Dorothy Duncan in a small-time circus. If she isn’t behind the scenes mending costumes or in the circus kitchen, she’s disguised as the fortuneteller, Maharani Shimza, Mystic of the East. Even so, she worries about being killed by the men pursuing her. She fears a brawl at her fortune telling tent that sends her into the Kincaid’s protective custody will end with her exposure and death. Then, a death at the circus implicates her. How can she escape when that attorney pops up every time she turns around? “But you don’t think I could if you told me more, is that it?” He gently clasped her shoulders and turned her to face him. Slowly he slid his hands across her shoulders, lightly up her neck, and caressed her face with his thumbs. He rested his hands gently on either side of her face. “Then let’s make it a little more complicated.” He leaned forward and claimed her lips. She dissolved against him. His gentle kiss increased in fervor. Her arms slid around him and her fingers weaved into his hair. His hands slid across her back. Stroking. Touching. Hugging. One of his strong hands skimmed her ribs beneath her breast. Brazenly, she wished he’d move higher where she ached to be touched. As it was, the heat of his touch near burned through her clothing. And he did. Not that she was an expert, but her verdict was he kissed very well indeed. Caroline is a member of Romance Writers of America and the Romance Writers chapters of Yellow Rose, From The Heart, and Hearts Through History. Her latest publications include the acclaimed historical Men of Stone Mountain series: Brazos Bride, High Stakes Bride, and Bluebonnet Bride and the audio books of Brazos Bride and High Stakes Bride. Caroline and her husband live in the heart of Texas cowboy country with their menagerie of rescued pets. Prior to writing full time, her jobs included stay-at-home mom (her favorite), secretary, newspaper reporter and featured columnist, assistant to the managing editor of a psychology journal, bookkeeper for the local tax assessor and -- for a short and fun time -- an antique dealer. When she’s not indulging her passion for writing, Caroline enjoys reading, travel, antiquing, genealogy, painting, and getting together with family and friends. The excerpt really made me want to read more of the book! Bev, thanks for stopping by. Glad you enjoyed the excerpt. It's been ages since I read a "circus" story. What fun. Thank you! That was what I found interesting about this book as well! Mary, thanks for stopping by. I loved incorporating the circus atmosphere to make this story unique among my books. Tin, thanks for hosting me today. I enjoyed the excerpt, sounds like an interesting book. Thanks for the giveaway! Thanks for commenting, Serena. Love your name. Loved the excerpt, sounds like a good read. Thank you, Rita, for stopping by and leaving a comment. Love the excerpt! Woo woo! I love discovering new authors ! Kimberly, we love being discovered! Thanks for commenting. What a really fascinating excerpt. I loved it. Mom Jane, I hope you'll enjoy the book. Thanks for commenting. What a great excerpt! Thanks for sharing. BookLady, Thanks for stopping by and leaving a comment.